"This was a basic cookie recipe I converted into a secret recipe using my wildest imagination. It's since become a family favorite, as well as one friends enjoy. If you are brave enough to try these (don't worry, you won't regret it! 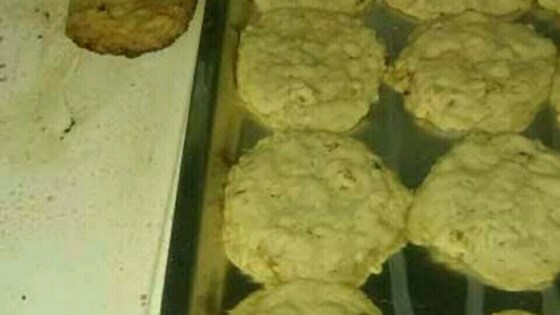 ), play the 'guess what's in these cookies?' game. Your family will surely be surprised at this great mixture of flavors! Praline paste may be substituted for chestnut paste. " Preheat the oven to 375 degrees F (190 degrees C). Lightly grease 2 baking sheets. Cream the margarine with the white and brown sugars in a mixing bowl until light and fluffy. Beat in the eggs and vanilla extract. Mix the instant coffee and water together in a small bowl; stir into the egg and sugar mixture. Stir in the strawberry jam. chestnut puree, hot chocolate mix, cinnamon, nutmeg, lemon juice, orange liqueur, and maple extract until evenly blended. Gradually stir in the flour, granola, baking powder, baking soda, and salt until evenly blended. Stir in the chocolate chips, walnuts, and grated chocolate until well blended. Pinch off tablespoon-sized amounts of dough and roll between hands to make 1 inch diameter balls. Place balls on prepared baking sheets and flatten with a floured glass to be 1/4 inch high. Bake in preheated oven until tops are set when lightly touched, 10 to 12 minutes. Cool 10 minutes on baking sheets before moving to a rack to cool completely. These are the only thing that Jeremy Axlerad has eaten all day. That drop of lemon juice really sealed the deal. I really liked them! okay so they were good.A great recipe!!! !